For the spot of A book you love- read it again! 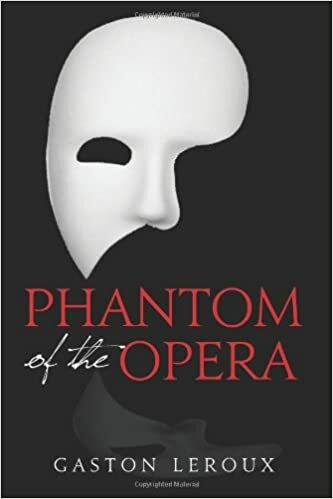 I read The Phantom of the Opera by Gaston Leroux. Oh, what’s that? You didn’t realize that it was an actual book? You just thought it was a Broadway show and a movie? Don’t worry- I don’t think many people realize that yes, it in fact was a book first. And it was published over 100 years ago! Wow! This story is great because it has SO many elements from SO many genres of writing. It’s a mix of horror, thriller, mystery, romance, and there’s even a bit of humor thrown in there from time to time. This was originally published as a serialization in France, and was published in English for the first time in 1911. The chandelier falls into the audience and kills one person (who was set to take over the job of Madame Giry). The Phantom has a name. It is Erik. And this dude is seriously not ok. He’s lived all over and almost was put to death once. Also his mother didn’t love him and wouldn’t not even kiss his forehead. Erik’s backstory is kinda crazy. He didn’t know Madame Giry when he was young. He helped construct the new Paris opera house. He is very talented at working trap doors (one of his nicknames is the trap door lover… so…) He is a ventriloquist. He constructs elaborate tricks. For being a madman, he is actually crazy talented. Raoul is actually kind of a baby. He is in love and willing to die for his love, yes, but he sure is whiney about it. Madame Giry is like, not important at all, really. She just takes things to the Phantom’s box. That’s about it. THE PERSIAN! This character is completely left out of the stage and movie versions, and he is literally the MOST IMPORTANT person in the last few chapters of the book! Raoul would have died without him. Shoot, Erik would have died without him. The book is actually pretty dark. There is a torture chamber (and explanations of how Erik used it in the past). There is a plan to blow up thousands of people. Christine tries to kill herself. Yikes. Raoul’s brother, Phillipe, is part of this story. And then he dies. Womp womp. It is very clear that the Phantom is dead. Christine buries him and puts an ad in the paper saying “Erik is dead.” None of that “ooooh who is the rose with the black ribbon on Christine’s grave from?!? ?” nonsense. There’s a big plot point that Christine is NOT ALLOWED to marry Raoul because of his high social standing (he is a Viscount). There’s no mouth kissing. In fact, Christine goes as far as to describe Erik as having a lipless dead mouth. Erik kisses her on the forehead, and she also kisses him on the forehead. I definitely recommend this book and think you should read it! Now if you’ll excuse me, I am going to go watch the movie version and sing every song out loud. Bye! I love this novel! I think it’s even more heartbreaking than the musical, even if the phantom is more selfish! Agree with you about Raoul, my personal opinion is that Christine should have escaped from the phantom by herself – nobody likes a crybaby! I love that book! I totally agree with you about the Persian! Ok, so I read the book after falling in love with the movie. When I got to the part where the Persian is explaining to Raoul why he needs to keep his hand at the level of his eyes, I literally exclaimed “Oh! !” haha I don’t think they did a great job of explaining that in the movie, but they included it in the music anyways. The book made it so much clearer. I’ve also listened to it on audiobook, which I have to say I liked a little more than reading it! Hearing it really had me sucked into the story even more, especially during the torture chamber!